In the early 1990s the Gulf War broke out in the Middle East. It all started when Saddam Hussein decided to invade the neighboring country of Kuwait. They had no grounds to do so and it was seen with bad eyes by the entire world. The United Nations approved a coalition that was started by the United States. U.S. allies included Egypt, the U.K. and Pakistan, plus thirty other countries. Iraq declared that they were invading Kuwait because they had been stealing their oil, and their plan was to make Kuwait an additional Iraqi province. The coalition was capable of stopping the insurgents by transforming Highway 80 into the Highway of Death. There were several reasons why Saddam Hussein decided to invade Kuwait. First of all, they had an outstanding debt of $80 million, which was used to pay the expenses of the Iraq-Iran war years before. Obviously, Hussein had no intention to pay off the debt because they were in a tight spot. Second, Kuwait was generating an excess in petroleum, which in turn affected Iraq's revenue. Even though Hussein accused Kuwait of stealing from them, the real reason seemed to be their envy. Last, Iraq had always felt that Kuwait was a missing region of Iraq, and that it should have been returned to them. Luckily, the U.S. forces were capable of backing the Iraqi troops off by closing them off in the Highway of Death. The majority of casualties during the Gulf War and the Highway of Death weresuffered bythe Iraqi side. At the beginning of the conflict, nobody thought it would end with a devastating Highway of Death. Nonetheless, the entire world could guess that Iraq was invading Kuwait simply to overtake their petroleum production. Kuwait had been generating a lot more oil than Iraq, thus affecting their revenue. In addition, there is still some controversy in regard to the meeting that Hussein had with the U.S. Ambassador at the time, April Glaspie. The ambassador allegedly told Hussein that the U.S. had no opinion on the conflict. Some believe this made Hussein think that the U.S. would not interfere with the invasion in Kuwait. He went forward with the invasion, and the U.S., along with the coalition, stopped the Iraqi troops at the Highway of Death. This was the end of the seven-month Gulf War. Even though the main defender of Kuwait was the United States, they had a tremendous amount of help from other members of the coalition. 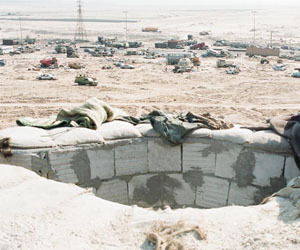 During the final attack at the Highway of Death, the combat lasted for about ten hours, where the U.S. military forces acted along with the British, the Egyptian and the rest of the coalition. In terms of funding, Saudi Arabia was capable of covering about $39 billion, which represented at least half of the expenses of the war. Kuwait was victorious due to the effort put for forth by the coalition at the Highway of Death.